That Pesky Dragon is another favorite, worth fighting little tykes for at the library. Kidding, of course; as a grown adult you can grab it faster than a child and won’t have to fight. But be sure to have your child pretend he/she found it. “Izzy’s dad had a farm. And on that farm there was a herd of cows…a flock of sheep…some chickens…two dogs…three cats…and a dragon.” The fire-breathing dragon causes chaos on the farm; his breath hard-boils eggs and turns their cow’s milk to yogurt. And he won’t go away. 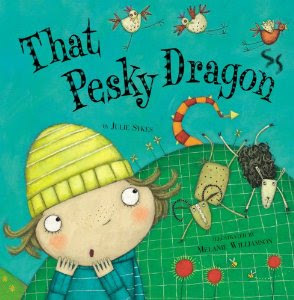 Julie Sykes’s writing is delightful and yummy; like Izzy, I want to meet this dragon that Grandpa calls too dangerous. I want to turn pages. The vibrant color and style of the illustrations is perfect for the story. Melanie Williamson captures the animals with simple shapes and fun details to hunt for, like the cow juggling milk cartons. Don’t be surprised, if at the end of the story, your child asks for a pet dragon…that pesky dragon is too cute! What Do I Know of War?